Liberals: If anything, they do one thing in particular very well. They get angry and that anger is currently pointed at President-elect Donald Trump…well, that and with Trump’s proposed cabinet…well, that and with conservatives. Basically they’re pissed at ANYTHING that doesn’t fall in line and agree with them. One independent journalist found this out the hard way when he joined in a protest against Trump’s proposed labor secretary, Andy Puzder. Puzder is the CEO of CKE Restaurants, which is the parent company of the popular fast-food joints Carl’s Jr. and Hardee’s. So, it’s no surprise that many of his employees are minimum wage because they do entry-level work. So, it should also be no surprise that the “Fight for $15” campaign has targeted his nomination with protest. 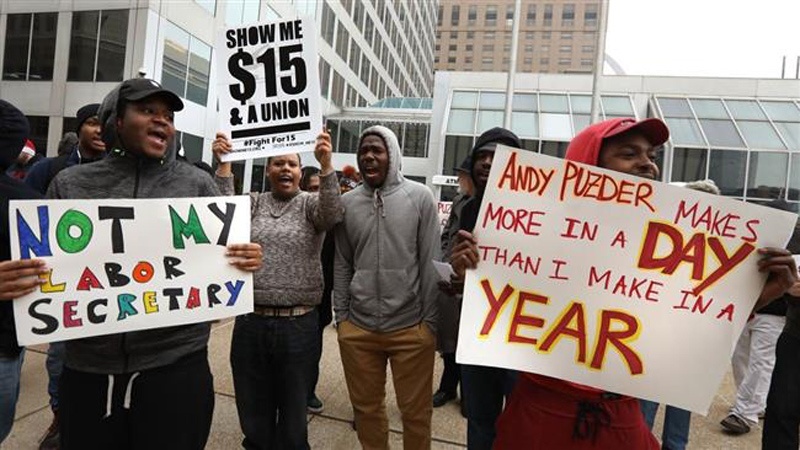 If you are one of those folks who are complaining about the nomination of Andy Puzder, you would figure you would have a solid idea of who and why you are protesting, right? I mean, if you are spending your time yelling, chanting and being all around obnoxious, at least do your own homework and find out what the freaking issue is! What I mean is, you should be able to recognize the name of the person you’re protesting when it’s given to you by a reporter. “Do you guys know who Andy Puzder is?” Asked the man in the video. Almost all of the protesters answered that they indeed did not know. One protester suspiciously said she knew…but would rather she “point you to someone who really knows,” which is not the most self-assured statement coming from a community organizer.